This post grew out of a couple of impulses. One was to explore tea grown in the U.S. I was gifted teas grown and processed in Oregon by a friend, enjoyed them, and wondered if there were other tea farms making similarly enjoyable tea. 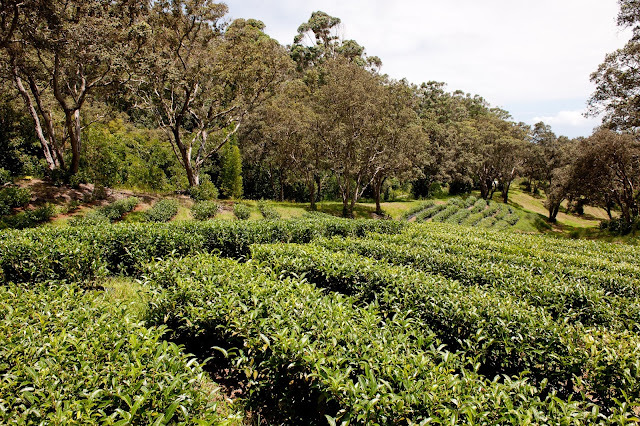 I came across Elyse Petersen's article for the Daily Tea titled "Grown in the USA" and more recently found Tony Gebely's round up of "Where tea is grown in the United States". The second impulse was an interest in business partners who are also life partners after reading Inc.'s 6 Inspiring Couples Proving You Can Mix Work and Love. I reached out to several tea companies and Kimberly Ino of Mauna Kea Tea was the first person I spoke with. Read our interview below. 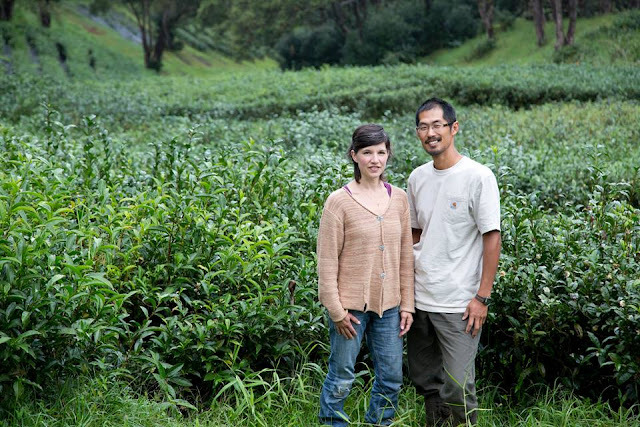 Kimberly and Taka did not initially set out to start a farm but they both loved tea. The two met in college as environmental science students. Taka is from Japan while Kimberly grew up in the San Francisco Bay area. After graduating from UC Berkeley, Kimberly and Taka travelled and during this time discovered their love for Hawaii. They acknowledged that the island offered a nice growing climate but neither was ready to settle down. They lived in Japan for a couple of years before marrying in 2004. Shortly before relocating to the land that is now Mauna Kea Tea farm, the couple backpacked, and discovered, China. Kimberly pointed out some of the contrasts between Japanese and Chinese tea, including Japan to have more streamlining with less variety than the great world of China, where they found their inspiration. 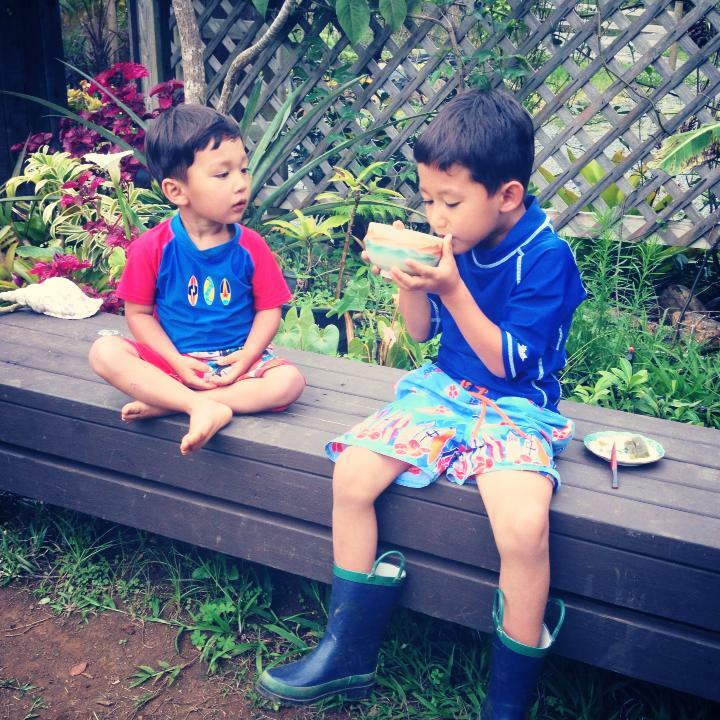 Kimberly and Taka bought land on the Big Island not knowing what they would grow. Taka enrolled in a tea growing class offered by the local agricultural research station. Within a few months, they planted their first cuttings. Kimberly noted that at first it was trial and error. They did not have access to any formulas for making tea in Hawaii. Taka chose to process their teas in a Chinese style but developed a recipe that suited teas grown in Hawaii that would appeal to the American palate. Mauna Kea Tea specializes in green teas. Their oolong is lightly oxidized, similar to a pouchong, but will be phased out this year in favor of producing blends using other Hawaii grown ingredients. Most of their sales are wholesale with accounts at restaurants, local natural food stores, and gifts shops. They sell retail at the farm, on their website, and at community events. Mauna Kea Tea is a true partnership. Kimberly and Taka have assumed roles that best fit their skill sets. Kimberly is the operations manager. She manages finances, sales, marketing, order fulfillment, and packaging. She also leads the farm tours. Taka is the grower, tea maker and producer. Since the farm has hired staff, Taka spends less time on the ground, so to speak. He also leads the IT and graphic design components of the company. In addition, he is the farm's "philosophical advisor"; he has developed a business structure that reflects their core values of community, growth, excellence, giving, and innovation. Although their focus has been on a more Chinese style of processing, Taka trained in a Japanese Tea Instructor program to understand how to evaluate teas objectively. Alumni of the program have helped Taka to refine his process and to "make tea better and better". Compared to when they started the farm 11 years ago, today there are more resources for tea growers, in this region, through the University of Hawaii College of Tropical Agriculture. The college has been involved with tea growing on the Big Island for 20 years and has conducted economic feasibility and best growing methods studies among others. 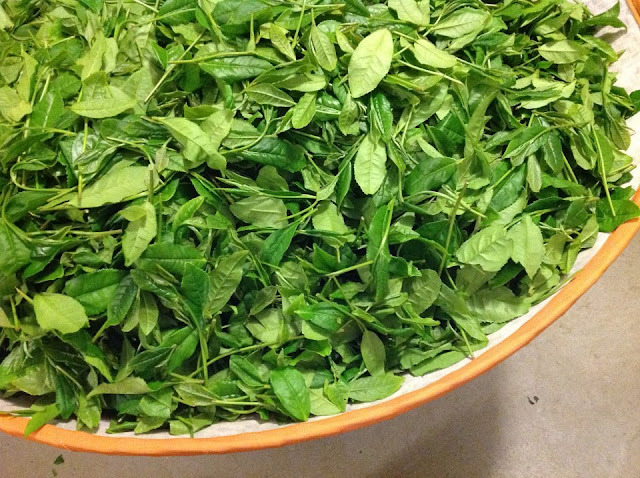 Many growers rely on the college because there is not a lot of external information, in English, about how to grow tea and how to grow it in Hawaii. Even on the Big Island, there is a lot variability in elevation, soil types, and other environmental factors. Before closing, I asked Kimberly for her predictions of tea. Although somewhat doubtful, she hopes to see tea drinkers seek out more information about the teas they are drinking, where and how they are produced, and choose authenticity in locally grown products with production methods you can trust. We opened and ended the interview with talk about our children. Her sons like tea; they drink it as a family, it's always part of their routine. My thanks to Kimberly Ino for the opportunity to learn about Mauna Kea Tea. All photos used with permission of Mauna Kea Tea. Seriously cool post. I've had their tea on two separate occasions. Worth it. Thanks so much, Geoff. I'm dreaming of a visit.